A researcher asked me to investigate an event that involved something you don't hear about every day. In 1831 two men debated whether George Washington was religious. A clergyman from St. Paul's, Rev. William Jackson, was asked to help resolve the question. Let's take a look at who's who. Robert Dale Owen (1771-1858) was a Scottish-born social reformer and freethinker who immigrated to America in 1825. Owen and his father established a socialist utopian community in New Harmony, Ind. Owen and fellow reformer Fanny Wright edited the New Harmony Gazette in Indiana in the late 1820s and the Free Enquirer in New York City in the 1830s. Both publications specialized in controversy, advocating radical views on a variety of subjects, including abolition of slavery, support for women's rights and birth control, and religion. After Owen became a U.S. citizen, he was active in the Democratic party. He served in the Indiana House of Representatives (1835–39 and 1851–53) and US House of Representatives (1843– 47). As a member of Congress, Owen introduced and helped pass the bill that established the Smithsonian Institution in 1846. He was a member of its first Board of Regents and served on the Building Committee. Rev. William Jackson (1793-1844) was the second rector of St. Paul's in 1827, after the previous rector, Rev. William Wilmer, left to become the president of the College of William and Mary. Rev. Jackson remained until 1832, when he became rector of St. Stephen's, New York, then of Christ Church, Louisville, Ky., in 1837. He was the first rector of St. Paul's Louisville until his death. There was a tension between religious skepticism and faith, including the role of religion in politics, during period between the American Revolution and the Civil War. The freethinkers believed that people could discern the truth through logic, reason, and empiricism, as opposed to doctrine, tradition, and dogma. In short, freethinkers didn't believe anything based on insufficient evidence. The debate was not an in-person event but a discussion that took place in the pages of The Free Enquirer over 10 months. In an exchange of lengthy letters, Bacheler and Owen debated the existence of God and the authenticity of the Bible. They did not limit themselves to God and the Bible, but they made use of every philosopher, historical reference, and esoteric citation they could. The discussion was later repackaged as a book; it is not light reading. So what do we know about Washington's religious nature? Washington's family had a long association with Pohick Church, an Episcopalian church in Fairfax County, Virginia. Washington's father, Augustine, sponsored the first rector in 1736. According to Rev. Lee Massey, Pohick's second rector and a close friend of the Washington family, Washington was a dedicated parishioner. Even though Washington regarded Pohick as his home church, he attended services at Christ Church when he stayed overnight in Alexandria. Washington also attended Christ Church in Philadelphia, during the Continental Congress. When a former aide-de-camp and close friend, Col. John Fitzgerald, held a dinner in 1788 to raise funds for the construction of a Catholic church (what is now the Basilica of St. Mary in Alexandria), Washington made the first donation. As president, Washington wrote the clergy of Newport, Rhode Island, standing in favor of religious liberty. Washington was a Freemason, which required every member to profess a belief in a Supreme Being. One Sunday during the Revolutionary War, Washington asked and received permission to attend a communion service at a Presbyterian church in Morristown, NJ. A Baptist chaplain in the Revolutionary army baptized Washington into the faith in a private ceremony. Washington either became a Catholic either shortly before his death or was considering it before he died. Many such stories appear in books and footnotes, or were simply oral tradition. Efforts to authenticate them were unsuccessful. It was impossible to find any written documentation or living witnesses; those people still living who might have known had unreliable memories. This is what happened to the Owen-Bacheler discussion. Both men drew on apocryphal stories and third-hand information as proof or disproof of Washington's religiosity. In his final letter, Bacheler offered as conclusive evidence a letter “from the rector of a church in Alexandria, in answer to one written by my request by Rev. Dr. Milnor of this city, ought to set the question for ever at rest...."
Bacheler does not say why the letter was addressed to Rev. Jackson and not to Rev. Charles Mann, who was rector of Christ Church Alexandria at the time. Rev. Milner had a connection to George Washington through his father, a prominent merchant who did business with Washington before and during the Revolutionary War, and who was a frequent visitor to Mount Vernon. Bacheler might have known about this and about Rev. Milner’s acquaintances with clergy in Alexandria to ask such a favor. While he was in Philadelphia for the Continental Congress, on Communion Sunday, Washington left the church with other congregants just before the Lord's Supper, leaving Mrs. Washington behind. The rector, unhappy at the example Washington set, later gave a sermon on public worship mentioning prominent individuals who were setting a bad example for the others. Washington got the message and never attended services on Communion Sunday again. Owen only knew about the sermon from a newspaper article, yet there appears to be some truth to it. The rector, Dr. James Abercrombie, recounted this story in a letter to a friend in 1831. It was considered important enough to include in Dr. Abercrombie's profile in "Annals of the American Pulpit." November 22, 1831 - Rev. Jackson forwarded a testimonial from the granddaughter of Rev. 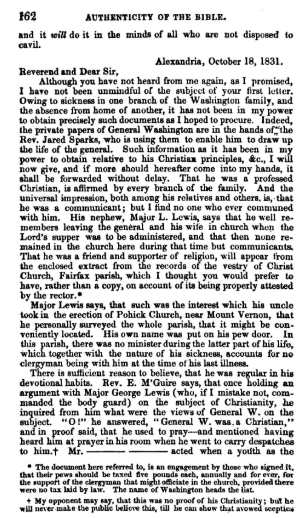 Massey who confirmed Washington was a member of his church. Rev. Jackson vouched for her, saying it was the best he could do and ought to be enough. December 7, 1831 - In Rev. 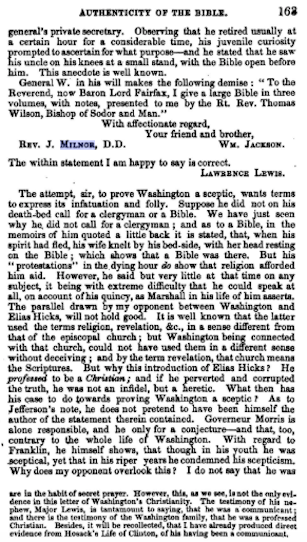 Jackson's final letter he said he was unable to acquire any other decisive information but according to his relations, Washington was a professed Christian. "...the path of true piety is so plain as to require but little political attention. To this consideration, we ought to ascribe the absence of any regulation respecting religion from the Magna Charta [sic] of this country." Washington was aware of the influence he carried both as president and as private citizen, so it's clear he took great pains to emphasize religious toleration in writing and through his behavior. This is a subject that has engaged many historians over the centuries so it was easy to get into the weeds of the topic. Thanks for reading! Boller, Paul F. "George Washington And The Presbyterians." Journal of the Presbyterian Historical Society (1943-1961) 39, no. 3 (1961): 129-46. Retrieved from http://www.jstor.org/stable/23325410, 29 June 2018.